Richmond Memorial Library continually provides access to physical and virtual resources and services that meet the educational, informational and recreational needs of its diverse community in a safe and comfortable environment. The history of public libraries in Batavia begins shortly after the arrival of the first settlers in Genesee County in 1801. On the second Tuesday in November of 1804 a group of local citizens met at the home of Abel Rowe and formed the Batavia Library. Joseph Ellicott served as chairman of the group, with trustees Richard Smith Esquire, Dr. Reuben Town, Major William Rumsey, John Brennan and Nathaniel Coleman. For the next twenty years the Batavia Library served the information and recreation needs of the growing village until it was dissolved in 1826. By 1836 a group of young men from Batavia formed the Franklin Club "for the purpose of endeavoring to enlarge the means of intellectual improvement in the village in every reasonable way." Recognizing the need for a public library they set out to gain community support for their project. Unfortunately, it appears that they had little success at the time, since no mention is made of their establishing a library. In the late 1830s William Seaver, a prominent citizen and newspaper editor, ran a circulating library in the village of Batavia with a collection of books that included science, religion, history, and fiction titles. In 1872 the Batavia Library and Reading Room made its appearance on the scene. Talked about for many years, it became a reality when four local citizens each donated $500 to the cause. Spurred on by these generous donations, other citizens added their names to the subscription roll. The library subscribed to a variety of newspapers and periodicals and housed over 1,000 volumes on its shelves when it first opened its doors. Membership in the Library Association cost $2 for individuals, $3 for families. On November 13, 1872, Mrs. M. E. Sheffield was appointed the first librarian. Mr. William Howard served as the second librarian. In the 1880s the Library Association fell on hard times and in 1884 was dissolved. The books were taken to the high school library, which was open one hour a week for the public to draw books. The principal of the school acted as the librarian. In 1887 Mary E. Richmond announced her plans to donate a library to the village in memory of her son, Dean Richmond, Jr. He was the youngest son in the family and the only one of her children to have been born in Batavia. Dean Richmond, Jr. was born on October 29, 1853. Upon graduation from Racine College in 1874, he went abroad for several years. On returning to America, he went to Denver, Colorado where he formed a partnership in a hardware business with his brother, Edward. After three years, Mr. Richmond sold his interest in the firm and in September of 1883 he became a partner in the business of S.F. Scott & Company, a real estate firm of Kansas City. He was also senior member of the firm of Richmond & Company, and Secretary-Treasurer of the Richmond Cattle Company, a concern that controlled 60,000 acres of land leased from the government in Indian Territory. These businesses were prosperous and Mr. Richmond was very interested in them when taken ill with typhoid-malaria in the fall of 1884. He recovered, then returned to his mother's home in Batavia. He suffered a relapse on his arrival and died at age 31 on February 2, 1885. His mother, Mary E. Richmond, was one of Batavia's most widely known women. She was born in Troy, New York in 1813, the second of two daughters of Hathaway and Electa Mead. Both parents passed away by the time Mary was twelve, and from then on she made her home with her grandparents. She was sent to Mrs. Willard's Academy to be educated and upon graduation she lived with her sister, Harriet, who had become the wife of Brigadier-General Enos Hopping. It was in General Hopping's home in Syracuse that Mary met her future husband, Dean Richmond. They married on February 19, 1833. The Richmonds and their growing family lived in Syracuse, Buffalo, and Attica before moving to Batavia in 1853. They purchased a home at 211 East Main Street which was the residence of Mrs. Richmond until her death 42 years later. Mary Richmond presided over the mansion with dignity and grace, and was loved by townsfolk and visiting dignitaries alike. It was said that she dressed in quiet elegance and possessed many beautiful jewels. The mother of nine children, she was active in community affairs. She served as president of the Holland Purchase Historical Society, gave generously to St. James Episcopal Church, the Young Men's Christian Association and the Batavia Relief Association. She supported all undertakings designed to aid the welfare and development of Batavia and was financially interested in many local businesses. Noted for her charity and her sharp business acumen, she expanded her husband's estate, listed at $1,500,000 at his death, to an estimated $6,000,000. Mrs. Richmond decided upon a library due to the affection of her husband for the school system of the United States. He had been strong in the faith that good schools and the means of imparting knowledge were the strongest safeguards of our institutions. Mrs. Richmond donated a piece of land on Ross Street, at the rear of the family property, for the site of the building and announced her plans to spend $9,000. Mr. James Cutler, architect, inventor of the Cutler mail chute, and later mayor of Rochester, was hired to design the new library. When the original plans were submitted, Mrs. Richmond found them unsatisfactory. The building was greatly inferior to what she had planned to construct. Thereupon, she increased her donation for the building to $24,000. The interior of the building was designed with suggestions from Jewett Richmond, nephew of Mrs. Richmond and president of the Buffalo Library Association, and Librarian Larned, director of the Buffalo Public Library. On July 11, 1887, ground was broken for the new library and, following Mrs. Richmond's wishes, local workers were hired to do the construction. The general contract went to John Lennon and Son of Lockport. Messrs. Dellinger and Glade received the contract for enclosing the building and setting the cut stone which was supplied by W.C. Woolsey of Medina. The mason work was sublet to John Shafer and the interior cabinet work was done by the Woodworks Company of Batavia. Almost two years later, on March 12, 1889, the building was formally presented to the Union Free School District No. 2. Henry A. Richmond officiated at the presentation, as his mother, Mrs. Mary Richmond, and sister, Adelaide Richmond Kenney, looked on. Mr. George Wiard, president of the Board of Education accepted the building. Gardner Fuller, Superintendent of Schools, also offered a few remarks. The building presented by Mrs. Richmond was of light gray Medina sandstone and red Albion stone, two of the finest building materials available in this part of the country at that time. The style was Romanesque, popular with builders of the day. The dimensions of the original building wre 87 feet across the front and 87 feet in depth. "Ascending the low broad flight of stone steps near the center of the front, the visitor stands first in a wide vestibule with a handsome tile floor and under the large half-circle arch which forms the principal entrance. From the vestibule a massive oak door gives entrance to the hall, at the end of which is the window communicating with the stack room. At the right of the hall on entering is the toilet room and cloak room for gentlemen, next to this that for ladies, and the third door on that side of the hall gives access to the librarian's office. On the left of the hall is a large pair of folding doors opening into the reading room, which is the feature of the interior of the structure. This magnificent room is 24 feet wide by 42 feet long and 15 feet high. At the end of the room, directly opposite the entrance in a recess formed by the half-circle arch, is the great fire-place finished in red brick tile and surmounted by a handsome oak mantel with rich carving and above the shelf a large oak frame on which is a bronze tablet bearing this inscription: 'This building erected A.D. 1887 as a memorial of Dean Richmond, Jr., by his mother, Mary E. Richmond.' The tablet is oblong in shape and fits into the woodwork over the fireplace. A large and very ornate pair of wrought iron and-irons completes the fire-place which has a brick tile hearth. The room is arranged with handsome tables and chairs on either side, and Mrs. Richmond has provided a handsome outfit of wrought-iron gas fixtures, comprising a massive and elaborate central chandelier of twenty-four lights pending from the ceiling between the heavy oak beams and also a bracket light of wrought iron with an argand burner and porcelain shade for a reading light over each of the tables. The room is handsomely panelled in antique oak for a height of 7 1/2 feet on a line with the bottom of the windows, which are filled with plateglass in suitable patterns in the transoms. All the interior finish of the reading room, hall, librarian's room and toilet rooms is of antique oak, and an extra room for storage of pamphlets and extra work has been arranged in the second story over the librarian's room and toilet rooms. Access to this part of the building is by a winding stair in the octagonal turret, which is a striking feature of the exterior. This staircase also extends to the cellar, in which the heating apparatus is located. The stack room has adjustable bookshelves with a capacity for 20,000 volumes, and it is expected that there will be, after they are assorted, in the neighborhood of 10,000 volumes placed in the library." On Saturday, April 6, 1889, the library was officially opened to the public. The library shelves were stocked with books recently purchased, the books of the old Batavia Library Association, and those of the Union School. All residents of the school district could use the library, while non-residents paid $1 per year. Miss Mary Elizabeth Wood served as the first librarian in the new structure. Known as "Lizzie" to family and friends, she had a reputation for being "old-fashioned in dress" and for having "a great personality, and distinction." At weekly storyhour, Miss Wood would give children hot cocoa which she made on a small grill located in the rear of the stacks. She also allowed children to play hide-and-seek in the library, but Miss Wiard, her assistant, did not. Miss Wood served as librarian until 1899 when she went to China to visit her brother, Robert, a missionary in Wuchang. It was in China that she did her greatest work in promoting libraries, starting the first circulating library there in 1902. In 1899, Miss Julia May Booth was chosen to replace Miss Wood at Richmond Library. As a graduate of the Library School in Albany, she was the first librarian educated for the job. Miss Booth's philosophy was that books were precious, not to be handled carelessly, and that the librarian's duty was to direct the reading of the patrons who came past her desk. She remained as head librarian for thirty-six years. 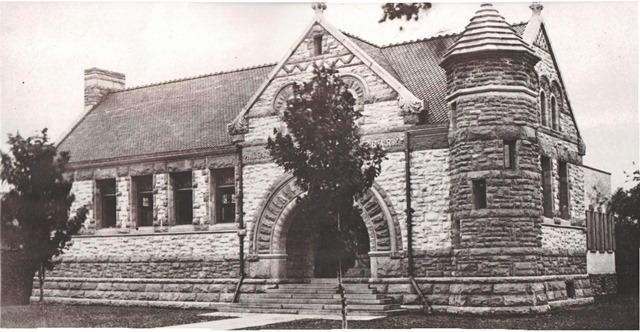 By 1911, more space was needed for the library, and plans were made for a small expansion on the north side of the building. Mr. E.H. Ellison of Jamestown prepared plans for the addition and John Pickert of Batavia was awarded the building contract. The value of the building was thus increased to $43,000. Miss Adelaide Kenny Richmond, niece of Dean Richmond, Jr. and granddaughter of Mary Richmond, agreed to fund part of the addition, donating a sum of $1,500. "one of the most conspicuous, attractive and convenient library buildings to be found in any village or small city of the state. Space and shelving have been provided for an indefinite growth. The old barrier, shutting readers out of the stack room, which was made of solid masonry and seemed an essential part of the building, has been removed sufficiently to allow the people of the village that greatest boon of the modern library - free access to all the books." Once again, in the 1930s the library's need for additional space became apparent. In 1937 a major remodeling and modernization program was undertaken at a cost of $11,415. Frank H. Homelius was the architect for the work and the general contract was awarded to Carl Espersen. The building was transformed into the library most users would know during the 1940s, 50s, and 60s. Oak shelving was added to two walls in the reading room in order to house the fiction collection. Trestle tables and Windsor chairs adorned the center of the room. The circulation desk was moved to its position by the front door, where it stood for the next 42 years, with the librarian's office behind it. Metal shelving was removed from the rear room and maple shelving was placed along the outside walls of the room, allowing patrons better access to the library's book collection. More than 1,300 new titles were added, especially in the technical areas such as aeronautics and modern science. A children's room was opened in the basement, stocked with reading material appropriate for preschool to sixth grade. A side entrance on the building led directly to the children's area. A bronze plaque was placed in the children's department, dedicating it to Julia May Booth, librarian from 1899 to 1935. At the rededication ceremony held on November 30, 1937 to mark the modernization of the library, Miss Mabel Case, library director at the time, stated: "We are keeping open house today and we will continue to do so every day. It is your library and we want to make it a friendly and helpful place." Public library systems were emerging throughout New York State during the late 1950's, and individual libraries were encouraged to join. Membership in such systems would allow for state aid and a variety of support services such as centralized purchasing and processing of materials, interlibrary loan, rotation collections, and consultant services, among others. 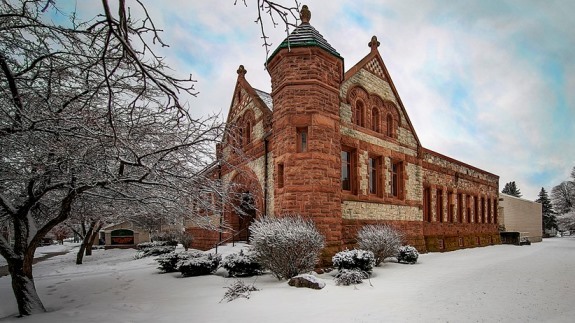 In order to join the NIOGA Library System, which included the public libraries in Genesee, Orleans and Niagara Counties, Richmond Memorial Library had to first obtain a charter from the New York State Board of Regents. Miss Case put together the necessary application which was approved by the Batavia Board of Education, and on January 28, 1960, an absolute charter was granted to the Library by the New York State Board of Regents. The Richmond Memorial Library was incorporated as a school district public library, with a five-member Board of Trustees that included Dr. David Johnson, President; Mrs. Frank L. Pixley, Vice President; Mr. Hollis R. Upson, treasurer; Mrs. Frank E. Owen; and Mrs. Ralph B. Chapin. Trustees were to be elected by qualified school district voters, and were to serve five-year terms. The library building and books would still be the property of the school district, but the policies and administration of the library would be under the jurisdiction of the Board of Trustees. One of the first items of business for the new library board was to sign a contract on March 23, 1960, with the NIOGA Library System. This agreement outlined the services NIOGA would provide to the Richmond Library, and in turn, indicated what obligations the Library would have for the System. Benefits derived from such a move were obvious: in-depth reference services, a larger book pool, better access to interlibrary loans, and networking. Even though the Board of Trustees approved new shelving to ease the crowded conditions at the Library, by the early 1960s it was apparent that the facility needed to expand. Property next to the library was purchased in 1963, the house on it razed and a parking lot was installed. Meanwhile, the Trustees and Miss Ruth M. McEvoy, library director, asked the Board of Education to consider purchasing the former Richmond mansion which had served as the Children's Home. The Trustees wanted the entire site before it became "chopped up" into small segments owned by various individuals. On July 12, 1966, the School District purchased the Children's Home site on East Main Street with the idea that the Library would use that space for expansion. An architect, Clarence Donath, was hired, and a consultant from the Buffalo and Erie County Library was retained to help the Trustees make some preliminary plans. By the end of the year, the architect had prepared his drawings which suggested a one-floor addition to the Library that was smaller, "more intimate" and could easily be used entirely as a children's library. The open plan addition would utilize moveable partitions for flexibility. However, things did not go smoothly over the next few years. For one thing, the New York State Division for Library Development was not happy with the plans, preferring instead an entirely new library at a site closer to the main shopping district. Another complication was the desire by a group of preservationists to save the Richmond mansion and not have it leveled for library expansion. The problem was succinctly stated by Olaf William Shelgren, Jr., a landmark architect from a Buffalo firm, who said, "The biggest problem to be solved is to find a suitable use for the building; one that respects its inherent virtues, attracting people, and filling it with life and vitality... The second biggest problem is how to pay for restoration - rehabilitation." The Daily News editorial for October 10, 1967, also referred to the Richmond mansion problem by saying: "What is needed is a 'rallying point' - and a good purpose for the facility and a sensible plan for financing". By the summer of 1968 the issue was still not resolved. A Citizens Committee, headed by Karl Buchholtz, recommended either saving the mansion as a cultural center or if it was razed, building a new library on that site. Since there was no apparent federal or state funding for such rehabilitation projects, and no local groups could raise the money, the Richmond mansion was demolished in the fall of 1968. On June 21, 1969, a public referendum was held to authorize bonding for a new library building on the site of the former mansion. The school district voters defeated the proposition soundly: 576 yes votes to 1801 no votes. The plans for a new building, at least for the time being, were dropped. The northern end of the Richmond property was held as space for future library expansion, while the southern end was sold to St. Joseph's Church for a parking lot. The 1970s were frustrating for the Library Board and staff. The school district failed to fund the Library adequately, and in fact, threatened to drop it. However, public sentiment was very strong to keep the Library open and properly funded by the Board of Education. In 1970, a Library Study Committee, selected by Batavia City Council and the Board of Education, was authorized to investigate, study and make recommendations on the Library's funding situation. The Committee was chaired by the Rev. Paschal L. Acquavia and included Mrs. William Hancock, Mrs. George Young, Donald Ball, Norman St. Clair, Judge Charles Graney, and Lewis DelPlato. Their report reaffirmed the community's need for a public library and for a firm financial commitment from the Batavia School District. In the fall of 1973, a group of citizens, led by Mrs. Lucille Carr, expressed interest in establishing a "Friends of the Library" group. They became officially incorporated in June 1974, and in January 1975, held their first annual meeting. Their mission was to promote activities and services of Richmond Memorial Library. The first officers included Mrs. H. Blakely Harris, president; William Lowe, vice president; Mrs. Sidney L. Sherwin, secretary; and William Barbur, treasurer. Board members were chosen: Mrs. Charles Artman, Dr. Regis Deul, Mrs. Ernest Found, Mrs. Wesley Jackett, Harold Rice, and Mrs. Earl T. Watson. One of their first fund-raising activities was a used book sale held in December 1974. The Friends have continued to sponsor such a sale every fall since that time, and proceeds have been used to purchase audio-visual equipment, to sponsor speakers and programs, and to assist the Library with all sorts of public relations activities. Membership in the Friends of the Library is now at 200. The book sales have increased in frequency and are now held on a monthly basis. Proceeds from the sales are used to support library programs including summer reading programs, Books Sandwiched In, book and movie discussion programs, and craft programs. The Board of Trustees and the Board of Education agreed to submit an application for funding an addition to the Library through the federal Economic Development Administration's Local Public Works Capital Development and Investment Program in the fall of 1976. It was not until the second round of funding for this program, in September of 1977, that the Library was awarded $921,000 to begin construction of an 18,500 square-foot addition to the southeast portion of the original building. The plans had to be approved by the New York State Preservation Office because of Richmond Memorial Library's position on the National Register of Historic Places as of July 24, 1974. Indeed the plans were approved, which called for a two-level addition of masonry block compatible with the Albion and Medina stonework of the original library. The addition would triple the size of the Library's public service areas. The architect for the project was J. Marlin Casker of Habiterra Associates, a Jamestown firm, and the contractor was Louis Viele, Inc. of Batavia. Ground was broken on December 14, 1977, and in February 1979 the construction was complete. A formal dedication and cornerstone laying was held April 1, 1979. Visitors to the "new library' were excited by the many changes. There was space for 100,000 volumes and reader seats for 120 people, versus the 40-seat capacity of the old building. The Library was made accessible to the handicapped, and public rest rooms were added. The main reading room was cleared of old shelving and restored more to the spirit of a "reading room". The 1889 leaded windows were refurbished, part of the oak wainscoting was exposed and refinished, and comfortable furniture was installed. A chandelier from the former Richmond mansion was hung over the fireplace. In November of 1979, this room was dedicated to Mary Elizabeth Wood, the first librarian. The "Gallery Room", a separate meeting room with seating for 85 people, opened up possibilities for film programs, art shows, lectures and public meetings. The new Children's Library, on the lower level, tripled that department's capacity for books, records and study space. A separate area for story hours and craft programs made children's programming much more flexible. The need for supplementary funding from Genesee County had been recommended by the Library Study Committee as early as 1970, but it was not until the spring of 1978, that a county-wide group of interested trustees, library directors and patrons met to discuss a request from the County for additional funds. This group called themselves the Genesee County Ad Hoc Library Funding Committee, and was chaired by Mrs. Paul Marone, a trustee of Richmond Memorial Library. They lobbied intensely and, for the first time, Genesee County budgeted funds for the county's six public libraries in 1983. This supplementary aid continues to be a significant part of each library's budget. In the summer of 1981, NIOGA officials and a committee of member library directors began discussing the possibilities of an automated circulation system. The Richmond Library Board, along with boards of larger NIOGA libraries, considered some of the advantages of such a system, including: automatic overdue notices, a shared data base with NIOGA libraries, inventory control, improved interlibrary loan, and the replacement of manual files, among others. They sought the approval and financial backing of the Board of Education for the project. They agreed to fund Richmond Library's participation, and by the fall of 1984 a contract had been signed with the NIOGA Library System. It would take nearly two years to prepare the Library for such a change. All the holdings of the Library - books, records, periodicals, pamphlets - and all patron registrations had to be entered into the computer. In November 1986, the library staff was ready to try out the system, and the public enthusiastically accepted the new plastic borrowers' cards and computer terminals at every desk. Richmond Memorial Library had entered the computer age! In 1993 the traditional library card catalog of 3x5 cards was replaced with computer terminals. Library patrons were able to search online the holdings of the libraries in the Nioga Library System. Within a few years patrons were able to search the catalog from home, place requests for titles within the Library System and renew their items. In 1997, for the first time, the residents of the Batavia City School District were able to vote on funding for the library. Prior to this time funding for the library came through the Batavia City School District and its budget. Due to changes in New York State law residents were now able to vote on the library’s budget. In 1999 the Muriel H. Marshall Fund for the Aging in Genesee County granted funding for the SAGE Program. SAGE provides library services to homebound and resident senior citizens in Genesee County. Seniors who are confined to their homes due to extended illness, physical disability or transportation problems and who would like to enjoy the benefits that a library has to offer are eligible for the services of this program. SAGE also provides rotating collections of large print books and media items to senior housing complexes, adult daycare facilities, and nursing homes in Genesee County. As the 21st century began, the library established an online presence outside the four walls of the building. The library’s website allowed Internet access to an online catalog of libraries’ holdings, databases ranging on topics from genealogy to business to magazines to foreign languages. Downloadable e-books and music are also available. Digitization of paper materials in the library’s collection provides for preservation and wider access to materials. The wish to salute the vision and commitment of those people of a hundred years ago who believed in the importance of a free public library, and to the trustees and librarians who remained committed to that purpose over the years, prompts a similar wish to speculate on the future of Richmond Memorial Library for the next century. Undoubtedly, new technologies and programs in the library field will influence the methods of providing service to the public. Yet the basic, fundamental purpose of library service - timely and free access to information, provided without restriction of censorship or violation of privacy - remains as true today as it has for the past 125 years, and for the next century to come. "Public libraries are and always have been symbols of continuity and social order. They embody the cultural, social, political and economic history of a society. They tell us where we came from and who we are. They are the custodians of value." The library will also be closed on Thursday, May 16 for a Staff Training Day. The library is located at 19 Ross St. in Batavia, NY, four houses from the corner of Main St (Rt. 5) and Ross St. The library is on the left side of the street. From Thruway exit 48, make a left at the first light onto Oak St. (Rt 98 S). At your next light, turn left onto Richmond Avenue. Richmond Avenue becomes North St. at the next light. Continue straight on North St. to Ross St. Turn right onto Ross St. Follow Ross St. Library will be located on your right, just before Main St.
A five member Board of Trustees is elected by the residents of the Batavia City School District to oversee the policies of the library. Trustees are elected to five year terms. The Board of Trustees meets meets on the second Monday of the month unless otherwise noted, in the Gallery Room of Richmond Memorial Library. All meetings begin at 6:30 PM unless otherwise noted. All meetings are open to the public. The Friends of the Richmond Memorial Library exist to support the mission and goals of the library. We welcome new and sustaining members. Join Us! We can never have too many Friends. Monthly Book Sales: Always the first Thursday of the month, 9am-7pm. Book sales are held in the Dorothy Wilber Memorial Room on the lower level of the library. Elevator available. All merchandise may be purchased at the main desk of the library. Volunteer Coordinators: Patricia Becker and Cindy Zarcone.